Are you looking to work one-on-one with a sales engineer in your area? 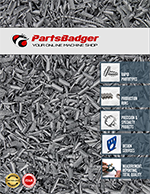 PartsBadger has team members throughout the US and Europe to assist you. They are available for calls, emails, and to schedule in-person meetings. Our team of sales engineers will provide the quality and customer service expected from PartsBadger. Check out our directory below and connect with your local area team member. Try our Rapid Quote tool online today. Receive a quote within 4 hours for general requirements. We’re here to help you manufacture your machined parts efficiently and timely. We understand the importance of getting your product(s) to market before your competitors do. We provide quotes in hours and most parts in 14-Days or less. Use the form to reach our specialists to request a quote, check on an order status, or to learn more about us and our capabilities. We’re ready to accelerate your innovation.